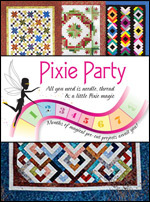 Welcome to the Pixie Party at Everything Quilts! Each of our kits with the Pixie Party have everything pre-cut and ready to sew - including all fabrics for blocks, borders and even the binding! All the work has been done for you so you can relax and sew happily along as you visit with friends or listen to some great music. Each kit features RJR's fabric collections and featured designers. Pixie Party quilt kits are perfect for beginners on up! Shop below for individual kits, or click here if you would like to join our Pixie Party Club and will mail them to your door! Don't you just love pre-cut Quilt Kits? We sure do - all the fun and no work!